This year was a pivotal period for the Third Reich’s relations with the rest of the world. Adolf Hitler announced he was reintroducing universal conscription, which was a repudiation of the hated Treaty of Versailles, and was warmly welcomed at home. In addition, as German troops marched into the Saar, he was determined to reintegrate those ethnic Germans who were living outside Germany back into the Reich. On the domestic front, more laws were introduced against Jews, who were becoming second-class citizens in their own country. 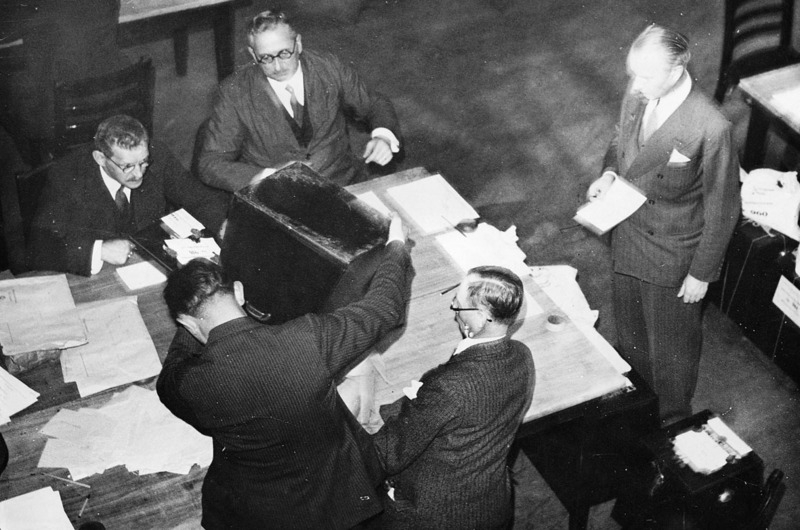 Counting the votes in the Saar plebiscite, which overwhelmingly favoured returning to the Reich. The inhabitants of the Saar overwhelmingly vote to return to the Reich, which in 1919 was placed under League of Nations control for 15 years under the terms of the Treaty of Versailles. The Saar plebiscite is the instrument upon which Hitler founds his “return of the Saar to Germany” campaign. The great SS Leaders’ conference is held in Breslau. An interesting illustration of the British policy of appeasement has been given in a British newspaper report: “Germany’s secret police are not always the sinister beings they are supposed to be”, and goes on to note “the happy faces of the SS chief and his men as they arrive at the meeting”.